Our “Little Roads” travel style usually involves visiting small towns with no train service. Consequently, all of our European visits are road trips. Though the prospect of driving in Europe is daunting to many travelers, adherence to a few key rules and concepts makes having a car not just possible but preferable for the kind of off-the-beaten-track touring that is the most immersive. Though we’ve never had to produce our IDP for European authorities, many countries (Austria, Bosnia-Herzegovina, Croatia, Greece, Hungary, Italy, Poland, Romania, Slovenia, Spain) require drivers to have this document, which is just a supplement to one’s regular drivers license. You’ll need it only if you’re in an accident or pulled over for a traffic violation - in which case, don’t add to your problems by not having this thing. Bring a passport photo to your nearest AAA office - you don’t have to be a member. It’s $15, and they’ll do your photos for you for an extra $10 or so. Like in the US, car rental agents in the EU will often “encourage” you to take on extra insurance (usually called CDW, collision damage waiver). Your credit card might carry some coverage for rental cars; contact them in advance to find out if they have any restrictions. (Some cards do not offer rental coverage in Ireland, for example.) Make sure you know what is and isn’t covered (CDW often does not include tires, wheels, mirrors, key loss, or glass breakage) and decide what you need for your own peace of mind. Flat tire? Insurance probably won't cover it. Even some experienced travelers don’t know that, unlike in the US, in many European countries you can rent from one location and drop off at another location (in the same country) without an extra charge. Get your car after visiting Venice for a few days, then drive down to Emilia-Romagna and then on to Rome where you drop it off and fly home. This allows for covering more ground on your road tour, wherever you’re going; and it may enable you to take advantage of better flight deals as well. Many countries are now mandating snow gear for all cars on the road during snow season. Ask the rental agency about this ahead of time - the regulations vary according to region and season. In many cases the company will have already added a winterization fee - just consider this as a bit of extra insurance, and know that you’ll be making up the cost by the fact that you’re traveling in the off-season. Rental agents will often try to up-sell you to a bigger, fancier car. We suggest the opposite, and ask if they have anything even smaller. Aside from the added liability involved in more expensive vehicles, many European streets are very narrow - you may have wanted that Mercedes at first, but when you’re pulling in your side-mirrors and squeezing through a tiny medieval French town’s cobbled street, or inching past an oncoming car in an English hedgerow, you’ll be glad you opted for the Fiat Panda. For many US drivers, the number one challenge of driving in the UK is the part where we’re driving on totally the wrong side of the road. By which I mean, Americans drive on the right side. Which is the wrong side. Some travelers are intimidated by this prospect, but you’ll get used to it quickly - remember, you’re already sitting on the right side of the car, so everything is a mirror-image to begin with. Just follow the flow of traffic, remember to go left at traffic circles, and when in doubt, pull over (to the left!) and collect yourself. We always drive a stick-shift, but when driving in the UK, consider the extra cost of an automatic transmission. The cost could be as much as a couple hundred bucks more for a week or so, but when contending with the opposite-side thinking, it’s nice to have one less driving action to think about. Historically, the term “standard transmission” used to refer to stick-shift, in contrast with the newfangled “automatic” transmissions. Nowadays in the US, this is reversed: Automatic is now standard. But in Europe, you’ll get a stick-shift by default. If you need an automatic, you’ll need to request it when you book your car (and it’ll cost extra), and then confirm it at the rental desk. Again, smaller cars are the way to go. Narrow roads are the norm all over Europe, but the hedgerow roads of great Britain and Ireland are a unique experience. Tall hedges loom up on each side, while the road itself barely fits your car alone. What, then, when an oncoming car approaches? The designers of these roads were clever; at nearly all points, whenever you see a car coming towards you, there will be a small widening or pull-off area in between you. You’ll both slow down to a crawl and approach that spot, where you can - barely! - squeeze by one another. Don’t hesitate to pull in your mirrors in these situations. To minimize how much you stick out as a tourist (therefore making you less appealing as a target of theft), make sure your suitcases are in some closed compartment not visible from the outside. Another tip: Look for a local newspaper or magazine - there are often free weeklies in dispensers on the sidewalks. Put one of those in your dashboard or on the back seat - a passer-by will glance and assume you’re a local. Crime is virtually nonexistent in small towns, but it’s better to be safe than sorry. These are a must-have for any European road trip. There’s nothing like the dejection of your camera battery crapping out halfway through your day, but that’s easy to avoid if you’re charging things as you go. While the US has for the most part stubbornly resisted adopting this traffic-reducing road feature, roundabouts or traffic circles are very common in most parts of Europe. It’s important to get the feel of these as quickly as possible. When in doubt, just follow the flow of the traffic. Most importantly: Don’t be afraid to circle around one or more times before taking your turn - this is a great way to avoid trouble as well as to look for the signs for the turn you’re meaning to take. Driving styles vary from country to country. When in a particularly aggressive driving environment (many parts of Italy, for instance), you’ll often find that someone is riding right on your rear bumper. This isn’t always considered rude or pushy at all; in fact, it’s possible your tailgater isn’t even paying any attention to you. If you’re uncomfortable, look for a place to pull over and wave the other driver past. We’ve even been tailgated by bicyclists! They weren’t mad at us - in fact, in one funny instance, when they passed by, they were busy chatting on their cell phone and smoking. Not all tailgaters are drivers. We in the US have grown accustomed to the ease of cross-country driving with its meticulously numbered highways. While many roads in Europe have route numbers, it’s best not to count on these, as signage tends to be intermittent. Instead, work out your routes according to which towns you’ll be passing through, and which are in the direction of your destination further along. Most crossroads will give town names and distances rather than a road number. GPS devices are impressive technology, but at times they’re inaccurate, especially in smaller towns and more remote areas. Though we rely on these most of the time, we still travel with an old-fashioned folding paper map as well, to help us get a broader view of the area. Pick these up at gas stations, rest areas, or bookstores. Navigating this way also allows for a better feeling for the geography of the place, rather than blindly following the voice on the machine. We primarily use a $5 smart-phone app called “Maps With Me”, which allows travelers to download extremely detailed and zoom-able maps of whichever country you’re visiting, and then view it off-line, saving a bundle in data charges. Always count on a drive taking more time than you think. We typically add an additional 25-50% to allow for getting lost or diverted, or just to stop and admire the place. Not only will this extra cushion of time allow you to arrive with many minutes left over before your next activity, but you’ll find that it’s fun to spend that extra few minutes taking pictures, exploring the area, or chatting with locals in a bar or pub. Many large cities, and also quite small ones, will have zones that are variously restricted. Make sure you know the rules for the area you’ll be visiting. Germany has its “Umweltzone”, which allows only vehicles of a particular environmental standard. In Great Britain, the central parts of the biggest cities will subject drivers to a hefty “congestion charge” if they’re not authorized as locals. 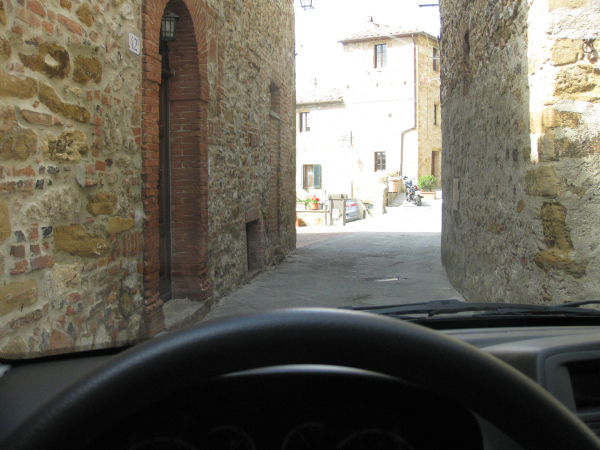 In Italy, punitive fines await violators of the “ZTL” or Zona traffico limitato in the historic centers of even many of the little towns. A white sign with an open red circle is often the only warning you’ll see. In general, plan to park on the outskirts of town and walk in, to avoid municipalities and rental companies hassling you for months after your trip. Rules vary widely for parking from country to country and town to town. Whichever country you visit, make sure you know the words for “car”, “parking”, and various forms of “prohibited”. Carry lots of change for “pay-and-display” machines. We advise not to be too picky - a half hour looking for a parking space that saves you two bucks might be much better spent hanging at the local watering hole for a coffee or beer. The ultimate goal in driving in Europe is not just getting to your destination, but getting there safely, with no dings or dents. Obviously you want to avoid having an accident. By following many of the tips above, you’ll reduce your chances of mishaps. It’s important to change your driving mindset: At home, when you know where you are going and how long it takes to get there, you often find yourself driving on mental autopilot. When driving in Europe, don’t be anxious - just be mindful. Drive more carefully, and take it slow; and any time you are in doubt, just pull over. Also, watch out for badgers. Interested in one of our road-trips in small-town Ireland or Italy? Consider our Itinerary Building Service - we'll plan a driving vacation for you that will give you memories that'll last a lifetime!